Other Products: Smooth White Cardstock, Funnel Tray, Scoreboard and paper trimmer. Instructions: The ready side fold card measures 6" by 7". Take cardstock measuring 11" by 6" and score at 4" on the longer side. To the 4" top fold of the card attach a die semi circle die cut using Frame a Card Leafy Borders Die for extra accent. Add pattern papers on the side half panel and inside of the card. 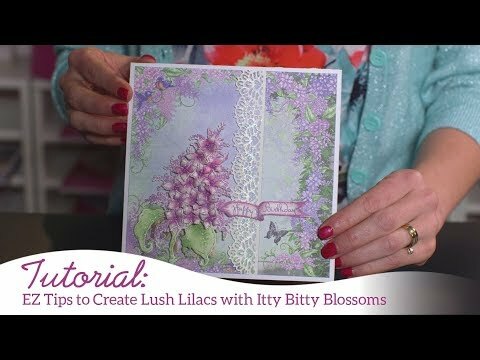 Choose a pattern paper from the Lush Lilac Paper Collection and cut a piece measuring 2 1/2" by 2 1/2". Score and cut at 2" and an using envelope punch board, create an envelope. Cut a fancy frame using outer 2 dies of the Basic Circle Small die and layer the envelope as shown. For Vellum Lilacs, first, white heat emboss the flowers, cut them using their coordinating die, and then color them using distress oxides. Shape them on the back of needle tool and press them in the center. Add prills to the flower centers. Cut embellishments from the Lush Lilac designer paper collection and form flower clusters around the focal images and add sentiments from the paper collection to finish the card.